← A.C. Grayling, the Jesuits and Prejudice. Grayling defends Protestant theology against the Jesuits? Jason Rosenhouse has posted a reply to my criticism of Grayling, not here but buried in the comments on his own blog so I thought I would promote it up here in order to answer it. Thanks for the link to Thony C’s post. It’s not very convincing, though, since it bears little relationship to anything Grayling wrote. Thony simply lists various scientific accomplishments of the Jesuits in the centuries following their initial founding. Fascinating. The fact remains, though, that the Jesuits were initially formed in large part to counter the spread of Protestantism and were fanatically devoted to a specifically Catholic understanding of Christianity, precisely as Grayling said. There is a reason the word “Jesuitical” is still used today as a derogatory term for an argument that is more devoted to making a case than it is in getting at the truth of something. According to Jason I apparently list ‘various scientific accomplishments of the Jesuits’, really? I was of the opinion that I had very much emphasised that ‘modern’ science was a central platform of Jesuit education and given the fact that they were without exception the most widespread and most influential European educational organisation in the 17th century makes their support of the latest scientific developments highly significant. We then have the claim that the Jesuits were formed in large part to counter the spread of Protestantism. This is not actually true; although the Jesuits did become one of the major spearheads of the Counterreformation they were not, contrary to popular opinion, formed for this purpose. It should be pointed out that the Dominicans, for example, were just as active as the Jesuits in the counterreformation and as opposed to the Jesuits, their deadly rivals, were totally anti-science. It was the Dominicans who agitated for Galileo to be censured in 1616. Jason’s implied claim that Grayling in only citing or criticising the Jesuit’s interpretation of Christianity is disingenuous to say the least. Let’s look at what Grayling actually says in the paragraphs before the one I quoted in my previous post. On one side are those who inquire, examine, experiment, research, propose ideas and subject them to scrutiny, change their minds when shown to be wrong and live with uncertainty while placing reliance on the collective, self-critical, responsible and rigorous use of reason and observation to further the quest for knowledge. On the other side are those who espouse a belief system or ideology which pre-packages all the answers, who have faith in it, who trust the authorities, priests and prophets, and who either think that the hows and whys of the universe are explained to satisfaction by their faith, or smugly embrace ignorance. Note that although the historical majority of these latter are the epigones of one or another religion, they also include the followers of such ideologies as Marxism and Stalinism – which are also all-embracing monolithic ownerships of the Great Truth to which everyone must sign up on pain of punishment, and on whose behalf their zealots are prepared to kill and die. If anyone does not know how to pluck from history and the contemporary world examples of these opposing mindsets and their operation then he is either deaf, dumb, blind and illiterate – or he is one of the creatures of faith. This is followed by the Jesuit passage. It is obvious that Grayling is contrasting the scientific method of enquiry, the first paragraph above, with what he sees as the anti-scientific closed-mind attitude, second paragraph above, of the Jesuits, his example plucked from history, third paragraph. It is more than somewhat ironic that Jason is claiming that Grayling is apparently defending Protestant theological veracity against smug, ignorance embracing Jesuit zealot killer commandoes. Which particular form of Protestantism does Jason think embodies all of the qualities of tolerance and open-mindedness that Grayling describes in the first paragraph quoted above; the Anglicans, who used political power to ban Catholics, Jews and dissidents from holding any form of public office in England from the 17th till the 19th centuries, maybe not. The Calvinists? O.K. I was only joking even Grayling would not attribute those qualities to an elitist, totalitarian theocracy, which leaves the Lutherans. Just a few historical facts about the Lutherans during the Reformation, the Philippists (that is the supporters of Melanchthon) drove the supporters of Andreas Osiander out of the Lutheran fold because Osiander had dared to interpret one aspect of theology differently to Luther. For those that don’t know Osiander was the reformer of Nürnberg the very first Lutheran town in Germany. After the death of Melanchthon, the Philippists themselves were driven out of the fold by the hard line Lutherans; Casper Peucer, Melanchthon’s son in law and a scientist, was thrown into the dungeons for 11 years as a crypto-Calvinist on the basis of no evidence whatsoever. Philipp Apian, professor of mathematics in Tübingen was deprived of his chair because he refused to sign the concordance formula i.e. agreeing to toe the Lutheran party line. Kepler, a trained Lutheran theologian, was refused access to the services in his local Lutheran church for the same reason. I can’t see much open-mindedness or tolerance here. This is the Luther who was a rabid anti-Semite and who on being informed of the upraising of the farmers under the Anabaptist Thomas Münzter screamed that they should all be slaughtered. Are these people really so worthy of protection against the evil Jesuits? One last point before I close. The Jesuits are portrayed by both Grayling and Rosenhouse as deliberate distorters of truth and as Sophists that is those who use hidden logical fallacies to win arguments, nothing could be farther from the truth and demonstrates how successful the anti-Jesuit polemics of the Protestants has been over the centuries. The whole point of the Jesuit education is to supply their scholars with the best and most accurate factual education possible while at the same time training them in the best use of correct logical argumentation. The point behind this education is to make the Jesuit able to demolish the arguments of his opponent by exposing the opponent false facts and false logic. Loyola realised that reliance on dogma and false argumentation would not enable the Catholic Church to win against the well educated and well informed Lutherans and only by being better educated, better informed and above all better trained in logic could he and his followers succeed in demolishing the arguments of their opponents. Jesuits win arguments not by twisting the truth but adhering strictly to it. Several commentators at Evolving Thoughts have remarked on the level of learning of the Jesuits they have known. I worked as a historian of logic for many years and all of the historians of logic and logicians that I have known, and that is naturally quite a lot, were all agreed that if you got involved in a strictly logical argument with a Jesuit scholar you were very likely to get your arse delivered to you on a plate. For shame, Thony. Spoiling a good strawman like the evil, casuitical Jesuits…. What will Grayling and his fans have to resort to now? You should be careful, though: the Jesuits learned from Savonarola not to provide a static head-on target but to bend with the wind – and then come back with ID. That’s what baffled me about Grayling’s piece. Even if the reader was to concede that Grayling’s depiction of the Jesuits is accurate (and it isn’t), one is still left with the question of how Grayling deems any one protestant sect to have proven itself superior in intellectual honesty. Judean People’s Front, anyone? It’s a very disturbing column, because it represents something of a throwback to old Catholic/Protestant rivalries that, although still sizzling in N. Ireland, have generally subsided on the mainland in recent decades (football-related rivalries aside). What was Grayling’s intent here? It certainly wasn’t to be objective, that’s for sure. What I find interesting about the arguments about history that you encounter on the web is the level of ignorance they evince. Didn’t anybody take a history course in college? The problem goes beyond not knowing about particular things like dates or names. With a few notable exceptions, the antagonists in these debates don’t seem to have a sense that people in the past had a very different agenda than we do. Indeed, to judge from some of the more manichean versions of history assumed in these threads, you’d think that what’s gone on since the Flood has been nothing but a struggle between the light and dark sides of the Force. Come to think of it, some of the dialogue in these parts does sound like it was written by George Lucas, which is not necessarily a good thing. Well, I shouldn’t be too hard on us amateurs. Grayling, whose op ed started this argument, has a pretty shaky appreciation of history and he’s a philosophy prof in the U.K. Who knew that educated Englishmen were still in arms about the Papists? Grayling sounds ready to participate in a new ground of the Gordon riots. He may have a shaky appreciation of history yet seems to have a very shrewd appreciation of how to deploy and develop a mythology in a text. “Myth is…..a projection of a vision of human fulfilment and of the obstacles that stand in the way of that fulfilment. He is not simply misreading history and making a mistake, his use of mythology is quite deliberate and given his own views on the use of mythology and ideology by others somewhat alarming. He is not an ill-educated creationist. Yet he is engaged in very similar practises to legitimate authority and his own ideology. You can’t simply reject these things as a mistake. They should be subject to a much fuller analysis as they occur with great frequency in learning institutions. Having heard Grayling unchained on Radio 4’s The Atheist and the Bishop, he immediately subverted his entire case by basing it on an allegory with a musical compositon. That’s a Catholic quadrivium doctine poorly understood and quoted out of context. This man’s supposed to be a Professor of Philosophy, so he cannot possibly excuse himself of ignorance. QED, it’s worth listening to – I soon gave up counting the number of unacknowledged references he and his lifted from a cultural structure they refute. He’s a parasite plain pure and simple. Grayling’s an odd case in general. He can be quite reasonable; but put him in certain contexts (like a Guardian article on a religious topic) and the rhetoric begins driving the argument rather than vice versa. Now that I’ve written that last comment and thought about it, and gone back and re-read the article, it really does read like Star Wars. It is a time of unrest in the Galaxy; as the Dark Side gains influence in the Senate, the ideology of the Sith begins to infiltrate the schools of the Republic. Fearing that this advance will go uncheck, the Jedi dispatch A. C. Grayling…. LOL. Meanwhile, on the barren ice planet of Hoth…. 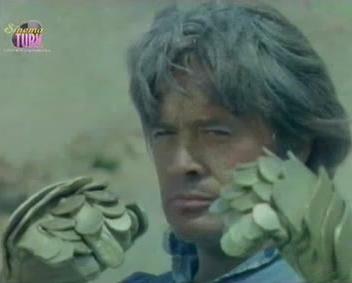 He bears more than a passing resemblance to the lead in the rather wonderfull B-grade Turkish version of Star Wars. Could they perhaps be related? Or do they just share the same hair-stylist.